Manchester City’s Raheem Sterling allegedly received racist abuse from a Blues fan, sparking widespread debate over racism in football and society. 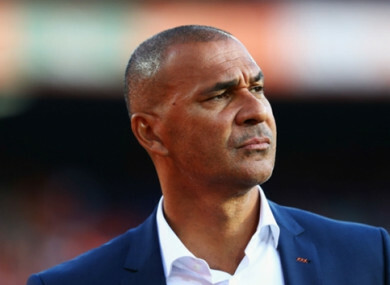 IT IS ALMOST impossible for black people to speak out against racism, says former Chelsea manager Ruud Gullit, because they take on a “victim role”. The issue of racism was thrown into the spotlight last week when Raheem Sterling allegedly received racist abuse from a Chelsea fan during Manchester City’s 2-0 defeat at Stamford Bridge. The England international then took to Instagram to condemn the language used, and hit out at media outlets for helping to “fuel racism” with biased news coverage. Gullit, who ended his playing career at Chelsea and took charge of the club between 1996 and 1998, told BBC Sport: “The biggest problem for us is to talk about it. “Because the moment you talk about it people say, ‘He puts himself in a victim role’, but it’s not that. “I talk from a very privileged position and I am happy with the position I have, but I cannot speak for people who are not in my position, who are struggling,” Gullit added. “I hope things change and people see it is not because we want to complain but because it’s there. Gullit featured in a discussion on BBC programme Football Focus which also included former West Ham and Montreal Impact midfielder Nigel Reo-Coker. Having his say on the issue, Reo-Coker said: “Raheem deserves support from his fellow pros, he has taken a big stand and done a very brave thing. It would be great if some other players would support him and have the belief and confidence to go out and be themselves. Sterling helped City secure a 3-1 win over Everton on Saturday by heading home a 69th-minute effort, just four minutes after Dominic Calvert-Lewin had halved the champions’ two-goal lead. Email “Ruud Gullit: 'Almost impossible' for a black person to speak out”. Feedback on “Ruud Gullit: 'Almost impossible' for a black person to speak out”.